Project Play explores and shares breakthrough ideas at three types of public events: Summits for large gatherings, deep-dive roundtables with thought leaders, and keynotes or panels held at major conferences of stakeholder organizations. Project Play also partners with organizations that hold public events. Jon Solomon, Editorial Director for Aspen Institute's Sports & Society Program, will speak about youth sports health issues at the association's annual conference for North Carolina high school athletes. The Community Foundation of South Alabama will hold its Annual Luncheon on Friday, March 23. The luncheon will take place at the Renaissance Riverview Plaza Hotel from 11:30 am -1:00 pm CT. This is a community-wide event with over 500 attendees, including community leaders, business men and women, nonprofit leaders, and elected officials. The Foundation is engaged in an initiative for all of our kids to reach their full potential. Guest speaker Jon Solomon, Editorial Director for Aspen Institute’s Sports & Society Program and former national college football reporter at CBSSports.com, will address how play leads to opportunity. The Aspen Institute Sports & Society Program released its State of Play: 2017 report at the TLC Summit in Aberdeen, Maryland. Editorial Director Jon Solomon spoke in a session called Big Issues Expert Panel about trends in the $15 billion youth sports market. Also on the panel were: ex-Washington Redskins player LaVar Arrington, Leveling the Playing Field's Max Levitt, YSC Sports' Gabby Roe, Maryland Sports Authority's Terry Hasseltine, and GTM Hanes CEO Dave Dreiling. The panel was moderated by Ripken Baseball Communications Director John Maroon. On the heels of the release of State of Play: Southeast Michigan, the Community Foundation for Southeast Michigan partnered with Project Play and the Ralph C. Wilson, Jr. Foundation to host three, large public meetings across the region. The meetings were an opportunity for the community to learn more about the details of the findings, provide input and reactions to the recommendations, and generate ideas for success. Free and open to the public. Registration was required. On the heels of the release of State of Play: Western New York, the Community Foundation for Greater Buffalo partnered with Project Play and the Ralph C. Wilson, Jr. Foundation to host three, large public meetings across the region. The meetings were an opportunity for the community to learn more about the details of the findings, provide input and reactions to the recommendations, and generate ideas for success. Over the past three years, the Project Play Summit has taken its place as the nation’s premier gathering for leaders at the intersection of youth, sports, and health. From Michelle Obama to Billie Jean King, grassroots innovators to foundation chiefs, media executives to policy wonks, the event has helped to take measure of, and push forward, the movement to build healthy communities through sports. Our theme in 2017 was “A New Scoreboard for Sports.” We explored alternate ways to measure success through emerging metrics, introduced major new initiatives, and heard from 60+ speakers, including a keynote conversation with Major League Baseball Commissioner Rob Manfred. The Summit, which sold out for the third straight year, had 400+ attendees and expanded to two days of programming for the first time. #ProjectPlay trended nationally on Twitter. Organizations made 33 commitments to action, including Project Play 2020, a multi-year effort by more than a dozen leading sport, health, media and other organizations to grow national sport participation rates and related metrics among youth. See the agenda and speakers from Day 1. Did you miss the 2017 Summit? Catch up here. Imagine if every child in East Baltimore had a chance to play sports. To know the camaraderie of a team, the feeling of a game-winning shot, or the perseverance to shave seconds off a personal best. To experience all the benefits – physical, social, emotional, cognitive, individual – available to people who simply move their bodies on a regular basis. To have a childhood that is playful. On June 22, 80+ leaders and stakeholders from across East Baltimore convened at the UA House to explore the forthcoming report, State of Play: Baltimore. The first research of its kind in East Baltimore, the report identifies key strengths and areas of opportunities to get local youth more active, healthy through sport. For more information, please email Andre Fountain at andre.fountain@aspeninstitute.org. Aspen Institute Sports & Society Program Executive Director Tom Farrey delivered the keynote address at the 2017 national conference of the North American Society for Sport Management, which supports and assists professionals working in the fields of sports, leisure and recreation. The purpose of NASSM is to promote, stimulate, and encourage study, research, scholarly writing, and professional development in the area of sport management. Topics of interest to NASSM members include sport marketing, future directions in management, employment perspective, management competencies, leadership, sport and the law, personnel management, facility management, organizational structures, fundraising, and conflict resolution. Tom delivered his keynote on June 2, 2017. 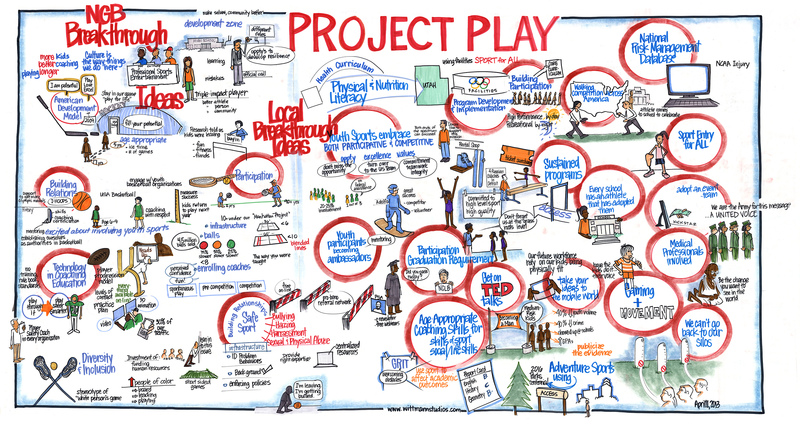 Four years ago, the Aspen Institute launched Project Play, an initiative to provide leaders with the guidance to help sport build healthy communities. Now, Under Armour and other community leaders are bringing Project Play to Baltimore. The goal: with teamwork, expand the quality and quantity of sport experiences for local youth so they can receive all of the associated physical, mental and social-emotional benefits. Join us to learn about how your organizations can play a role in – and benefit from – the initiative. UA House @ Fayette | 1100 E. Fayette St. Knowledge about the best practices in raising young athletes is constantly evolving. At this SXSW panel, Sports & Society Executive Director Tom Farrey joined Matt Bowers, Clinical Assistant Professor of Sport Management, University of Texas at Austin; Christine Bolger, Associate Director of Coaching Education, United States Olympic Committee; and Emmanuel Acho, NFL Linebacker/Media Personality to share the latest advancements in the science and policies in youth sports. The goal: to help parents (and those interested in youth sports) navigate the maze of new information on raising good athletes and good kids. The mission of the Aspen Institute is to foster values-based leadership and explore big ideas that serve the common good. So what does values-based leadership mean to NBA commissioner Adam Silver? And what ideas has he developed in his first two years as the head of organization that has engaged on social issues, while developing new partnerships with media companies and players? Tom Farrey, executive director for the Aspen Institute Sports & Society Program and an Emmy award-winning journalist, explored that terrain in conversation with Silver, ranked the most influential executive in sports by the SportsBusiness Journal. The discussion was open to members of the Aspen Institute’s Society of Fellows group, on a first-come basis. More event information was here. In partnership with Aspen Institute Mexico, Nike, and the Laureus Sport for Good Foundation, Project Play hosted its debut international roundtable in Mexico City. Bringing together 50+ leaders from business, government, and NGOs, at the intersection of youth, sport, and health, Project Play explored the opportunity to launch a symbiotic effort in Mexico. For more information in English, email Risa Isard (risa.isard@aspeninstitute.org). For more information in Spanish, email Mariana Solano (msolabo@aspeninstitutemexico.org). En conjunto con el Aspen Institute México, Nike, y Laureus, Project Play tuvo su debut internacional en la Ciudad de México con una mesa redonda. Reuniendo alrededor de 50 líderes de diferentes empresas, funcionarios de gobierno y ONGs, Project Play exploró la oportunidad de lanzar un esfuerzo simbiótico en México. "Sport for All, Play for Life: A Playbook to Get Every Kid in the Game"
What if non-profits, government, schools, philanthropy, business, pro sports governing bodies and leagues, and the media worked together to apply the best strategies for changing the city through sport + physical activity? What if these strategies addressed key elements of increasing levels of sport & physical activity while also achieving important social development outcomes? What if the best learnings from collective impact and the global sport for development movement were leveraged to ensure change that is comprehensive and lasting, resulting in improved health, better education, more equitable employment and economic opportunity, and more prosperous and integrated communities? The New Orleans Sport for Community Coalition, alongside Laureus Sport for Good USA and The Aspen Institute, hosted a community summit to discuss the work currently happening in New Orleans to move these questions from hypotheticals to reality. Over the course of the summit, participants addressed the targeted use of sports-based youth development in New Orleans, learned from collective impact experts about how to move the work forward, and charted concrete actions for how supporters from diverse sectors can work together to improve the lives of children and youth through the transformative power of sport. Featured speakers included ESPN's Michael Smith and the Aspen Institute's President and CEO Walter Isaacson, Sports & Society executive director Tom Farrey, and program associate Risa Isard. Email Risa Isard with any questions (risa.isard@aspeninstitute.org). The Aspen Institute Sports & Society Program, American College of Sports Medicine, the Global Obesity Prevention Center at Johns Hopkins, and Laureus Foundation USA hosted the Innovation Summit: Moving American Health Across the Spectrum of Physical Activity in Washington D.C. This invitation-only conference convened leaders from sport, physical activity, health, science, and technology across the public, private, and not-for-profit sectors. An academic journal article identifying next steps in elevating the most promising initiatives and developments in the space is forthcoming. The day included speaker presentations, ideation workgroups, and a fireside chat with U.S. Surgeon General Vivek H. Murthy. Other featured speakers included Sports & Society Program executive director Tom Farrey and program associate Risa Isard, Justin Kaufenberg of SportsEngine, Dr. Brian Hainline of the NCAA, Woody Scalof of Fitbit, Tom Cove of the Sports & Fitness Industry Association, and Edwin Moses, Missy Franklin, Bob Lujano and Benita Fitzgerald Mosley of the Laureus Sport for Good Foundation. Video is available here. Revisit the conversation via hashtag #SportHealthInnovate. Additional information is available in the program. As president of the NCAA, Mark Emmert leads one of the most influential and far-reaching organizations in all of sports. Nearly 1,100 universities and colleges with more than 19,000 teams and 480,000 athletes in three divisions are members of the NCAA, whose policies and practices impact the lives of people – and not just fans – in every community in United States. Today, more than $2.7 billion in athletic scholarship aid is distributed annually, up from $250 million in the early 1990s. The opportunity to play, and receive the benefits of participation in, college sports has reshaped the landscape of youth and high school sports over the past generation. Under Emmert since 2010, the NCAA has made health and wellness of young athletes at all levels a stated priority, along with the opportunity to receive a quality education. Sports & Society Program executive director Tom Farrey engaged Emmert in conversation about the role of the NCAA in building productive citizens and communities. How can it best promote mental and physical health from the college level down to the youth leagues? How can it provide athletic and educational opportunities for students from all communities, regardless of zip code? How much influence can it have at a time when the organization is being tested in the courts on a variety of issues, including athlete welfare? The wide-ranging conversation with Emmert was followed by audience Q&A. In the year since the release of the seminal Aspen Institute report, Sport for All, Play for Life: A Playbook to Get Every Kid in the Game, many organizations have taken action consistent with its eight strategies for the eight sectors that touch the lives of children. At the 2016 Project Play Summit at the Newseum, 450 leaders gathered to measure progress, share learnings and discover new opportunities to build healthy communities through sport. "This has to become a priority in our society," Obama said. "This affects all of us. Play and nutrition and overall investment in our kids — whether they can read and think and engage — it's just not enough for us to be okay with so many kids not having that at an excellent level. So whatever the dollar figure is, as a society, as taxpayers and as corporate America — we should figure out how much that costs, and then pay for it. Period." Obama was joined by more than 60 other speakers at the sold-out summit, the nation's premier gathering of leaders at the intersection of sport, youth and health. Among them: Mary Davis, CEO, Special Olympics International; Tab Ramos, Youth Technical Director, US Soccer Federation; Jim Whitehead, CEO, American College of Sports Medicine; Benita Fitzgerald Mosley, CEO, Laureus Foundation USA; Dr. Bennet Omalu, Chief Medical Examiner, San Joaquin County (Calif.); Dr. Risa Lavizzo-Mourey, President and CEO, Robert Wood Johnson Foundation; and Billie Jean King, civil rights pioneer. Several sessions were live-streamed, drawing more than 100,000 Facebook Live viewers, with the hashtag #ProjectPlay trending nationally on Twitter. What does the new research tell us? Can large orgs drive de-organization? How can PE, clubs collaborate? Who will be their champion? Can we systematize creativity in play spaces? How to engage the hardest-to-reach? Where to next with the American Development Model? Brain Injuries: How much science do we need to act? How to implement the concept? What works in building local coalitions? Treetops to grassroots: How to scale a culture of health in sports? Leaders from each of the following sectors attended the 2016 Project Play Summit: National Sport Organizations, Community Recreation Groups, Public Health, Business & Industry, Tech & Media, Policymakers & Civic Leaders; Education; and Parents. Insights shared during the event informed the conclusions of State of Play: 2016 report, a draft of which was released at the summit. The final version was released one month later and identified key developments of the past year in each of the eight strategy areas that create the framework for action in the Sport for All, Play for Lifereport, along with the latest sport participation rates for children and other original data. Like other states, Colorado faces challenges in dealing with a crisis of physical inactivity, parental concerns about injuries, and declining participation in youth sports. How can leaders work together to make sport more affordable, accessible and developmentally appropriate for all children? The University of Denver held the first Colorado Youth Sports Summit, an event that reviewed and recognized sport programs and activities that contribute positively to the overall development of children. The summit built on the work of the Aspen Institute’s Project Play, a multistage initiative to provide stakeholders with the tools to build healthier communities through sports. Led by executive director Tom Farrey, Project Play has used research and input from experts, including several from Colorado, to provide guidance for those of us working in youth sports. The goal of this summit was to reaffirm Colorado as a leader in the provision of youth sport programs that teach physical literacy and prepare young people for a lifetime of healthy physical activity. Only by working together at the state and local levels can we overcome the challenges that we face. More information is available on the event website here. At the world's leading conference for the sports events industry, a session was devoted to the Project Play report and its eight strategies for the eight sectors that touch the lives of children. Event organizers as well as leaders from national sport governing bodies and other groups learned how they can use the report to get and keep more children active through sports in their communities. Panelists in Las Vegas included Skip Gilbert, managing director of professional tennis operations for the U.S. Tennis Association and tournament manager for the U.S Open. At the 36th annual conference of the North American Society for the Sociology of Sport, a session titled "NASSS Coaches Assess the Project Play Report" presented an invited panel of NASSS members who are youth coaches to engage their sociological imagination and critically discuss the goals and recommendations in the Aspen Institute's Project Play report. The panelists in New Mexico explored questions related to the challenges and tactics associated with putting Project Play recommendations into action. The session recognized that although Project Play focuses on the U.S, it was partly informed by similar efforts in Canada, and is applicable to youth sports worldwide. The moderator of the session was Brian Gearity, professor at the University of Denver. Joining him as panelists were Gary Sailes, Indiana University; Katlin Okamoto, University of Minnesota; Jim Denison, University of Alberta; Algerian Hart, Western Illinois University; Anna Baeth, University of Minnesota; Jeffrey Montez De Oca, University of Colorado at Colorado Springs; and Ryan King White, Towson University. The session chair was Jay Coakley, University of Colorado-Colorado Springs and a member of the Project Play advisory group. More information on the conference is here. At the SAP InnoJam in Palo Alto, the Aspen Institute's Tom Farrey issued a challenge to student teams from Bay Area universities based on an opportunity identified in the Project Play report: Build a tool that can connect youth, parents and others to the full array of sport programs and sites in their communities. Two of the eight teams of coders and business students were assigned to the 30-hour challenge, and one of them -- "Team Rollick," comprised of students from San Francisco State and Chico State -- won the design thinking competition, with a prototype of a mobile app. The judging panel included senior SAP executives, including SAP Chief Human Resources Officer Stefan Ries. As winners, the members of "Team Rollick" showcased their app as part of the SAP University Alliances experience at the SAPPHIRE NOW conference in Orlando, Fla.
Sports and Society Program Executive Director Tom Farrey presented to 20 Community Olympic Development Program (CODP) directors at the CODP conference. He helped these leaders, who represent 15 programs from across the US, understand how they can activate and shape programming based on the strategies from the Project Play report. The increasingly sedentary lifestyles of children, and participation declines in many youth sports, are in part due to a structural reality: lack of access to safe, affordable, nearby recreation facilities. State, county and municipal leaders must find ways to avoid closure of more parks, recreation centers, and sports complexes. Challenging outdated finance and management models is essential. Funding is a key factor in the development of new parks and recreation centers and the maintenance of existing recreation assets. Communities that have been successful in addressing financing issues have developed innovative approaches that often involve private-sector budgeting models, public-private partnerships, and economic impact analyses which justify new or continued investment in sport and recreation centers. This roundtable of 25+ leaders built on a September 2014 roundtable that identified opportunities to grow access to recreation spaces, by focusing on facility financing solutions. Participants included Barbara Tulipane, president and CEO of the National Recreation and Park Association and Michael Kelly, general superintendent and CEO of the Chicago Park District, along with some of the brightest minds in sports finance. Sponsored by the Sports Facilities Advisory, the event informed the creation of a resource that can be used by key decision-makers to fund more recreation spaces. Why are Play Spaces Important? Boys & girls club of America: "great think"
Project Play joined Boys & Girls Clubs of America leaders for a think-tank style day in Washington D.C., to share best practices and shape policies for the organization. Tom Farrey presented the Aspen Institute's Physical Literacy report to leaders of the Multi-Sport Organizations Council of the U.S. Olympic Committee. He explained how it syncs with the Project Play report and the recent sport industry endorsement of multi-sport play. The session was open and free to the public. Back in February at the Project Play Summit, the Laureus Sport for Good Foundation announced that it would be convening a sport-for-development collective impact coalition to create a framework for stakeholders to work together effectively in order to improve opportunities for youth in New Orleans. Sports & Society Executive Director Tom Farrey also moderated a lively panel at Tulane University that focused on the challenge of retaining girls in sports. Participating in the dialogue were Olympic champions Allyson Felix (track) and Kelly Clark (snowboarding), former Saints running back Deuce McAllister, and Playworks chief marketing officer Tonya Antonucci. In the coming months, Project Play continued to support the coalition in New Orleans as it aims to grow access to quality programming across the city. Sports & Society executive director Tom Farrey spoke on behalf of Project Play at the 2015 National Recreation and Parks Association Annual Conference. More than 7,000 park and recreation professionals, citizen advocates, and industry suppliers gathered at the premier annual meeting of the park and recreation community. At the conference, Project Play shared Sport for All, Play for Life: A Playbook to Get Every Kid in the Game and emphasized the role that park and recreation departments can play in giving all children the opportunity to be active through sport. The future of play belongs to one of two realms – virtual or physical. Right now, virtual is winning the day. Video games, internet sites, and other technology options are more effectively engaging children, providing great exercise for thumbs and not much else. What will it take to steal back the concept of “play” and address our national epidemic of physical inactivity? Tom Farrey, executive director of the Aspen Institute’s Sports & Society Program, discussed the eight key strategies, as identified in the Project Play report released earlier this year. Tom Farrey, Sports & Society executive director and lead author of the Project Play report, was a featured speaker at the sixth annual Institute of Sports Law and Ethics Symposium at Santa Clara University. More information on the symposium is here. At the 2015 US Open, the Aspen Institute convened sport and media leaders to explore opportunities to encourage sport sampling among children, as outlined in the third strategy of the Project Play report, Sport for All, Play for Life: A Playbook to Get Every Kid in the Game. The pair of roundtables came in the wake of an "endorsement" of multi-sport play by 28 national sport governing bodies, five professional leagues, and other organizations. Led by the U.S. Tennis Association, the statement was announced in a PSA published Aug. 10 in the Sports Business Journal. It represented the first collective effort by the sports industry to mobilize around a key strategy in the Project Play report, and an unprecedented move to jointly address falling sport participation rates. A press event at the US Open helped to share the message more widely. Joining Tom Farrey was boxing champion Laila Ali, New York Rangers captain and Olympian Ryan McDonagh, Olympic all-around gymnastics gold medalist Nastia Liukin, and USTA chief marketing officer Sue Hunt. The roundtable and related activities help build momentum for sport sampling in sport and medical circles. In September 2015, the American Academy of Pediatrics cited the work of Project Play in issuing a position paper recommending that its 60,000 members advise against sport specialization until at least age 15. American Development Model -- Inspired by Project Play, the US Olympic Committee released a handbook offering NGBs, clubs, coaches and parents guidance on implementing age-appropriate play. Over the past decade, coalitions in about a dozen countries have embraced initiatives based on a desired outcome in individuals and populations called “physical literacy.” These efforts have been launched in response to a common problem in industrialized societies: declining rates of physical activity. But what is physical literacy? Can it be measured? And how to build a cross-sector movement around it in the U.S., with special focus on engaging our most vulnerable children? At this session at Spotlight: Health in Aspen, Colorado, the Aspen Institute Sports & Society Program released a white paper, supported by the Robert Wood Johnson Foundation, conceptualizing a path forward. Surgeon General Vivek Murthy delivered opening remarks, followed by a panel moderated by Sports & Society executive director Tom Farrey and featuring Kathleen Sebelius, former secretary of Health and Human Services; Dr. Kenneth Davis, president and CEO of Mount Sinai Health System; and Dr. Shale Wong, Professor of Pediatrics, School of Medicine, University of Colorado-Denver. The Aspen Institute Sports & Society Program and Project Play led a session at the 2015 International Physical Literacy Conference in Vancouver, British Columbia. The conference brought together sport, health, education and recreation experts to advance the knowledge, application and implementation of physical literacy programming across the globe. The session also marked the release of the Aspen Institute's global scan of physical literacy efforts, the first document of its kind (see materials below for downloadable PDF). Sports & Society Program Executive Director Tom Farrey delivered a keynote address, "Activating Project Play: How to Get All Youth Coaches Trained?" The theme for the 2015 National Coaching Conference in Morgantown, West Virginia was "Physical Literacy: The Launching Pad for Lifetime Athletic Development and Performance," a topic on which Project Play Advisory Group member Dean Kriellaars, professor at the University of Manitoba, also presented a keynote address. The National Coaching Conference was hosted by the United States Coaching Education Coalition, whose members include the U.S. Olympic Committee, NCAA, National Federation of State High School Associations, SHAPE America and National Strength and Conditioning Association. The conference brought together coaches, coach educators/developers and sport science researchers for the enrichment of coaching and sport. The program focused on current research and practice models for optimal integration of athletic development for both participation and peak performance. Project Play was among representatives from more than 70 disciplines that came together from around the globe at the American College of Sports Medicine Annual Meeting in San Diego to share new clinical techniques, scientific advancements and cutting-edge research in sports medicine, exercise science, physical activity and public health. At the meeting, Aspen Institute Sports & Society Executive Director Tom Farrey presented the Project Play report, Sport for All, Play for Life: A Playbook to Get Every Kid in the Game, and led a panel discussion designed to help the sports medicine community understand how it can take actions consistent with the report and its eight strategies aimed at giving all children the opportunity to be active through sport. He also offered a preview of the forthcoming physical literacy white paper, which was released in June. Technology is often blamed for falling participation rates in team sports. But tech isn't going away (nor should it). So, how do we use tech as an asset to reduce the barriers to an early positive sports experience for all kids in all communities? How can technology help in reaching the hardest-to-reach kids, the ones most often left behind by today's youth sports system? On the heels of the release of the Aspen Institute's Project Play report, Project Play spoke at SXSports for an engaging conversation about how technology - a solution to so many of society's needs - can help solve a broken youth sports system. Summary report from Project Play's tech roundtable: From Digital to Physical: Can Tech Make it Happen? Over the past decade, about a dozen countries have introduced, in a variety of forms, social movements based on a concept that has become known as “physical literacy.” Now we’re helping introduce it to the U.S. Defined by our working group as “the ability, confidence, and desire to be physically active for life,” physical literacy efforts are a response to a common problem in developed societies: declining rates of physical activity. What happens when 350 leaders gather to reimagine youth sports in America, guided by the Project Play report? A groundswell of efforts to make sports more accessible, affordable and enjoyable to more children. Highlights included the keynote address of U.S. Surgeon General Vivek Murthy, who framed youth sports as a tool of disease prevention, and, in a first for his office, emphasized the need to extend the benefits of participation to all children. Of the Project Play report, he said, "You have built a very powerful roadmap" for cross-sector collaboration that will help youth sports serve the needs of public health. During the summit, 17 organizations (including the NCAA, Major League Baseball, U.S. Lacrosse, afterschool programs and leading medical groups) announced commitments to action consistent with the strategies identified in the report. Since then, many other organizations have launched symbiotic initiatives. Event sponsors were the Laureus Sport for Good Foundation USA and Whistle Sports. Project Play partners included the Robert Wood Johnson Foundation, Nike, Laurie M. Tisch Illumination Fund, Clinton Foundation, University of Florida Sport Policy & Research Collaborative, and the President's Council on Fitness, Sports & Nutrition, and USA Bobsled & Skeleton. Additional thanks to ESPN, Wally Haas and William Mayer for their support. A nationally representative survey of parents conducted by espnW and the Aspen Institute's Project Play showed broad and often deep concern about the state of youth sports, on topics ranging from concussion risks to the costs of participation to the quality and behavior of coaches. With results in hand from the espnW/Aspen Institute Project Play survey, we co-hosted a roundtable at the conclusion of The espnW: Women + Sports Summit, where thoughts leaders reacted to the findings. The event helped define and elevate the voices of mothers in the conversation around quality youth sports. For more information, contact program coordinator Risa Isard. fields of dreams: innovate and they will come? Any true commitment to broad-based sports participation begins with infrastructure. Fields. Gyms. Rinks. Rec centers. Bike paths. Build, maintain and secure ‘em, or pay the price later. Federal support for such projects took a serious hit in 1980, and it’s never recovered. Today, we see park and rec departments under significant duress – and the rise of private, specialized athletic facilities whose programming is too expensive for many families. In Chicago, the Aspen Institute’s Sports & Society Program convened 40+ leaders for a Project Play conversation on how to grow the supply of safe play spaces that meet the needs of all children in all communities. Held at Navy Pier on the final day of the Illinois Youth Sports Summit, and on the eve of the U.S. Olympic and Paralympic Assembly, the dialogue identified breakthrough ideas in funding, collaboration and innovation that can serve urban, suburban and rural communities – each of which face its own distinct challenges. Leaders also considered ways that the hosting of an Olympic Games could best leave a legacy of community facilities. In collaboration with the Aspen Institute’s Project Play, the Illinois Youth Sport Summit convened 64 leaders from across a wide spectrum of state agencies and organizations that are responsible for the design, delivery, and execution of youth sports programming. The two-day summit explored the barriers that impair cooperation across sectors, and began the process of designing and sustaining youth programs that benefit all kids in all communities across Illinois. As a result of the summit, the Department of Recreation, Sport and Tourism at the University of Illinois has now created the Illinois Youth Sport Initiative, which will serve two primary purposes. First, it will provide a platform for sharing resources, insights, and strategies for positive reform of youth sport. Second, it will facilitate formulation and implementation of tactics to achieve such reforms, promoting alliances and collaborations among youth sport providers. The initiative represents the first state-based analog to Project Play, a national effort to reimagine youth sports in a form that delivers universal access to an early positive sports experience. Chalip, a member of the Aspen Institute’s Project Play advisory group, doctoral student Raquel Hutchinson, Operations Director of the Illinois Youth Sport Summit, and Jarrod Scheunemann, Community Services and Education Coordinator of the Office of Recreation and Park Resources will spearhead the state-based initiative. It will produce a white paper to summarize key ideas from the summit, and is forming working groups to action those ideas. The ideas flowed from the two-day summit at Navy Pier in Chicago, where the Aspen Institute’s Sports & Society Program also hosted a roundtable of 40 leaders, “Fields of Dreams: Innovate and They Will Come?” The events were held on the eve of the 2014 Olympic and Paralympic Assembly. For more information about the Illinois Youth Sport Summit, visit their website and read Reinventing Youth Sports in Illinois: A Report from the Illinois Youth Sport Summit. Children who are physically active enjoy a wide range of emotional, physical, cognitive and social benefits, and are far more likely to achieve their full human potential. At the Partnership for a Healthier America Summit -- one of the premier gatherings of leaders working to end childhood obesity -- Tom Farrey discussed how the Aspen Institute's Project Play will get and keep more kids active through the creation of early positive experiences in sports. Joining him to share their work in this space were Matt Geschke, director of the Laureus Sport for Good Foundation USA; Janet Froetscher, CEO of Special Olympics; and Chris Snyder, director of coach education for the U.S. Olympic Committee. Over the past year, the Aspen Institute's Project Play has begun to reimagine youth sports in America in a form that serves all children and all communities. A series of roundtables has established the value of anchoring our disjointed sports system in the principles of age-appropriate play, of training volunteer coaches in the basic competencies to deliver an early positive experience, and the need to grow sport participation rates among the most vulnerable populations. Now, how can stakeholders deliver scalable progress in each of these channels? Underwritten by Nike through its support of the Designed to Move platform, this roundtable of 30 leaders considered the role of, and opportunities for foundations, government, corporations and the health care sector. Leveraging Existing Resources: How Can Grant-Makers Align for Greater Impact? Unlocking New Resources: How to Bring More Players into the Game? Beyond Title IX: What’s the Role of Government? From Digital to Physical Play: Can Tech Make It Happen? Technology is often blamed for falling participation rates in team sports. But tech isn't going away. So how do we use tech as an asset, and reduce the barriers to an early positive sports experience? This one-day roundtable convened 40+ leaders from the realms of technology, business innovation, sport and academia to develop four emerging ideas that could change the game for kids and youth sports, one of the few industries whose model has yet to be disrupted (for the better) by technology. The event, underwritten by the David & Lucile Packard Foundation and hosted at Google, included a featured talk with Google senior executive Gopi Kallayil, who inspired attendees by drawing connnections to the company's eight points of innovation. Today, we all use Google or Apple Maps. One health services provider has introduced visually compelling “heat maps” of obesity rates by zip codes. With those examples as inspiration, we ask how mapping technology can be used in new and dynamic ways to understand gaps and opportunities in providing sport/recreation opportunities for kids. Lots of kids want to play sports but lack access to or fall out of the system, and never find the best sport option for them. On the supply side, we have less visible sport programs that need kids but don’t know how to identify prospects or reach them. How do we connect kids with experiences (organized or pickup) they might enjoy and find success at? We have passive video games like Madden or FIFA soccer. And we have active video games designed to promote physical activity. Despite progress, the latter haven’t been nearly as successful as the former. But what if we added features and functionality to passive video games that encouraged kids to get off the couch and play and sign up for real sports? As we move into a mobile-first world, can we build a simple, scalable, accessible app that offers a consistent architecture across sports, and would be most useful to parents, coaches and kids in helping create early positive experiences? The U.S. Olympic Committee has started down this path. We accelerate the process and blue-sky the killer app. Off the Bench: How to Get Health Pros into the Game of Youth Sports? Pediatricians, sports medicine doctors and researchers have valuable recommendations and insights on how to properly engage and protect children in sports – insights rarely considered by parents and sport organizers. This one-day event convened about 50 leaders from medicine, sport, academia and business innovation to address the role of medical professionals in informing the decision-making process in youth sports. The dialogue identified opportunities to integrate medical/health professionals into the structure of sport bodies, and grow the quality and quantity of resources that can provide care for youth athletes. Participants also expressed support for holding off on tackle football until age 14. Helping to inform the day's conversation was the University of Florida’s SPARC, which consolidated the recommendations made by 11 medical and health groups on topics related to children’s sport activity –- from sport specialization to physical activity. The roundtable was held in conjunction with the Developing the Healthy Athlete conference, with space provided by Disney/ESPN Wide World of Sports. Event sponsors were the American College of Sports Medicine; American Academy of Pediatrics; American Council on Exercise; Platinum Performance; Broad & Cassel, and the World Sports Institute. How to grow public, national sport bodies’ awareness of these recommendations? What are the barriers to adoption by sport bodies? How can insurance, other outside industries encourage standards? Should each NGB, local youth sport board include one allied health pro? If so, what is the best way to make that happen? How can physicians better connect kids with healthy sport options? How to address the lack of medical care at youth sporting events? How to more efficiently train health care pros in basic sport medicine? How to get every youth coach trained in basic CPR/First Aid? How to convince parents the recommendations are in child’s best interest? Parent asks whether child should play football: What to tell them? What’s the ethical response to collision sports in general? designing for universal access: how to reach all kids? How can stakeholders deliver more early positive experiences to underserved populations? In the third of four Project Play roundtables on how to grow the quality and quantity of youth coaches, we turned our attention to what’s possible in low-income and other communities that lack trained volunteers. We also considered the needs of other marginalized groups, including the intellectually or physically challenged, and begged the question: Can we build a socially inclusive model for youth sports in America? This invitation-only gathering of 25 thought leaders was held at the Clinton Health Matters Conference of the Clinton Foundation, a partner in the Aspen Institute’s Project Play. Participants included legendary golfer Gary Player, founder of the Player Foundation which serves disadvantaged children; Notah Begay III, founder of the Notah Begay Foundation and former PGA Tour golfer; Anita DeFrantz, CEO of the LA84 Foundation; Janet Froetscher, CEO of Special Olympics; Marj Snyder, research director for the Women's Sports Foundation; Ginny Ehrlich, CEO of the Clinton Health Matters Initiative; Benita Fitzgerald Mosley, U.S. Olympic Committee chief of organizational excellence and an Olympic gold medalist hurdler; Caitlin Morris, North America executive director for Nike's Access to Sport division; Eli Wolff, director of the Inclusive Sports Initiative; and Jill Vialet, CEO of Playworks. How do we get and keep more kids active in sports into the teenage years? On the opening night of the Clinton Health Matters Conference and in partnership with ESPN, President Clinton led a conversation on the central question of the Aspen Institute's Project Play with 15-time NBA All Star Kobe Bryant, one of the greatest players in basketball history. Tom Farrey, director of the Aspen Institute Sports & Society Program and ESPN reporter, also moderated panels featuring Major League Baseball All-Star Matt Kemp, Olympic champion sprinter Allyson Felix, NFL great and Heisman Trophy winner Herschel Walker, and U.S. Olympic Committee CEO Scott Blackmun. ESPN taped the Town Hall before a live, invitation-only audience of 400 health leaders and kids, and aired a one-hour, prime time special Feb. 9 on ESPN2. Watch video clips from each of the panels at the links below, and join the conversation on Twitter at #KidsAndSports and @AspenInstSports #ProjectPlay. "(Sports) made a huge difference to me because it made me feel comfortable with being with other people, " Clinton told ESPN's Mike Greenberg in his moderated conversation with Bryant. "A lot of kids are just uncomfortable in school. You play a few games and you're not so uncomfortable anymore. It's a way of belonging. It's a way of having a common language without having to open your mouth." Bryant came to the conversation from the perspective of both a father to two daughters and as a world-class athlete. Before the event, he said, "Today's kids are the least active in history and, dropping out of sports at alarming rates. I'm excited to join the Aspen Institute Project Play dialogue and partner with President Clinton, Nike and ESPN at the upcoming Clinton Health Matters conference to bring attention to the need for universal access and early positive experiences in sports and play." The Clinton Foundation is a partner in Project Play. During the Town Hall, Blackmun explained how the USOC will act on one of the breakthrough ideas explored during a Project Play event in September. He announced a Clinton Foundation commitment to action, with the USOC and U.S. Paralympics pledging to introduce the "American Development Model," a comprehensive and collaborative initiative that will seek to unify National Governing Bodies and community programs in keeping Americans active in sport longer. The model combines sport, play, education and health through a five-stage pathway that supports a positive sport experience based on the individual’s physical, mental and emotional development. Through its commitment to the Clinton Health Matters Initiative, the USOC will engage all 47 NGBs (national sport governing bodies) to endorse the American Development Model. Resources will include a dedicated presence at TeamUSA.org, coaching workshops, and educational materials to help guide parents, coaches, administrators and athletes. Also at the Clinton conference, Nike announced it will continue its partnership with the Aspen Institute to address the physical inactivity epidemic in today’s youth. Through its “Designed to Move” platform, Nike will support the convening of leaders in the sports world to develop scalable solutions that address seven key indicators of early sports experiences -– access, age appropriateness, dosage and duration, fun, incentives and motivation, participant feedback, and coaching and education. The solutions identified and developed through Project Play will be captured in a report to be released by the Aspen Institute at the end of the year. This feature explored the statistics and facts about kids' participation in sports in the U.S.
kid-focused, coach-driven: what training is needed? What does good youth coaching look like? What are the practical elements that every adult who works with children needs to be trained in -- from CPR to skills development to positive motivational technique? The second of four roundtables focused on how to grow the quality and quantity of youth coaches in the U.S. The Aspen Institute's Project Play convened more than 30 coaching leaders to consider the prospects of creating a simple, affordable, credible training platform that parents has the endorsement of organizations parents know and trust. Featured guests at the event, sponsored by Nike, included Alan Ashley, U.S. Olympic Committee Chief of Sport Performance. •What should a coaching structure look like in the U.S.? •What are the roles of key organizations? •How can coaches best foster early positive experiences? •What are the domains we want them trained in? •What's fair to ask of volunteers? What’s the best way to align, push training down the pipeline? Anderson is one of nine tennis teaching professionals to be certified as a Master Professional by the USPTA and the PTR. He has a Bachelor’s degree in Physical Education and a Master’s degree in Exercise Science from Western Michigan University. Anderson has published dozens of articles and written seven books on tennis. His honors include the International Tennis Hall of Fame Educational Merit Award, the Person of the Year by Racquet Sports Industry, the Professional Tennis Registry Professional of the Year and the Western Michigan University Department of Human Performance and Health Education Alumni Honor Academy. Ashley was named chief of sport performance for the USOC on Sept. 1, 2010, after serving as managing director of sport performance since January 2010. Ashley oversees the USOC divisions tasked with providing targeted resources and support to the National Governing Bodies, athletes and coaches in pursuit of sustained competitive excellence. These areas include coaching and sport science, sports medicine, international games and sport partnerships. Sport performance is also responsible for the preparation and execution of all Team USA activities related to the Olympic and Paralympic Games. Ashley joined the USOC after 16 years with the U.S. Ski and Snowboard Association, where he was a key contributor to the rise of the U.S. ski and snowboard teams, having most recently served as the vice president of athletics. Avischious works in the Club Development Division for USA Swimming, the national governing body for the sport. He is in his 19th year with USA Swimming where his main responsibility is oversight of the field staff that visit with clubs and coaches. Prior to this position, he was the Programs & Services Director where he helped develop and oversee most of the current programs designed to help USA Swimming member clubs and coaches. Baumann’s responsibilities at USA Diving include coach education, training and certification. Prior to coming to USA Diving, Jason was the Diving Coach for the University of Minnesota and ran the Twin City Divers club diving team. He coached Junior, and Senior National Champions, NCAA All-Americans, and medalists in International competition representing Team USA. He has been involved with USA Diving for 34 years as an athlete, coach, and administrator. Jason holds a Master's Degree in Kinesiology from Indiana University. Beatty is a Ph.D. student in the Performance Psychology Laboratory, directed by Dr. Christopher Janelle, at the University of Florida. Prior to beginning his Ph.D. studies, Garrett spent two years as a secondary educator, football coach, and track & field coach. Garrett also served three years advising the Sport Management major at UF. Garrett's primary research foci include studying how the emotion regulation strategies individuals' employ influence their ability to perform motor tasks. Ultimately, Garrett is interested in seeing this work applied to improve performance in athletes, emergency response professionals, military personnel, and individuals engaged in clinical rehabilitation protocols. Boyer has been with U.S. Lacrosse since 2008 and worked in the finance department until 2011 when she moved over to coaching education. Prior to her time at U.S. Lacrosse, Kyle worked for DC United of the MLS in accounting from 2007-2008, served as the head women's soccer coach for North Park University in Chicago, IL from 2005-2007 and was in public accounting from 2001-2005. Boyer holds a masters degree in banking and bachelors in sociology. Carter joined Coaching Corps, formerly Team-Up for Youth, as Executive Director in 2008 and has led the expansion of Coaching Corps from a local Bay Area organization to a national leader in the sports-based youth development field. Coaching Corps recruits, trains, and places passionate volunteers as coaches in after-school programs to work with kids living in low-income communities, providing them with the health, educational and social benefits of having a trained coach as a teacher and role-model. For 15 years prior, Janet served as Vice President of the Family Violence Prevention Fund, now called Futures Without Violence, helping to grow the organization from a local nonprofit to a national leader in the effort to end violence in the family. She has served on numerous boards and is past Chair of the Annie E. Casey Foundation’s Children and Family Fellowship. Cernich joined the Sports & Society Program in December 2012 to help build out the Aspen Institute's Project Play. Andrea most recently served as Vice President for Sponsorship and Marketing for the Women's Sports Foundation, founded by Billie Jean King. Previously, she worked in the Obama Administration as Director of Strategic Partnerships for the President's Council on Fitness, Sports & Nutrition, where she cultivated relationships across sports, physical education and community-based organizations to fulfill Administration programmatic and outreach goals. Prior to the President's Council, Andrea managed outreach for a national coalition of sports-based youth development programs and was also Director of Communications for the Sporting Goods Manufacturers Association where she engaged mass market, specialty and retail brands on industry issues including product safety and increasing sports participation. Chan currently serves as the Orfalea-Brittingham fellow at the Clinton Health Matters Initiative (CHMI), where he oversees the management and cultivation of CHMI's programmatic commitments. Prior to joining the Clinton Foundation, Alex was the City Planner for a mid-sized suburb in Southern California. He holds a master's in urban planning from the University of Michigan and recently completed graduate degrees in public administration and communications management from the University of Southern California. Coakley has for 40 years done research on connections between sports, culture, and society with much attention given to the play, games, and sport participation of young people. Coakley is an internationally respected scholar, author, and journal editor and has received many professional awards. His book, Sports in Society: Issues and Controversies, is used in universities worldwide. He continues his work to make sport participation a source of enjoyment and development for young people, and to make sports more democratic and humane for people of all ages. Cole joined USA Volleyball in 1998 as an Administrator for the Coaching Accreditation Program (CAP), and in 2000 became the Coordinator for the Nike VolleyVan and Assistant for Grassroots Programs. Cole assumed the role of Manager of Coaching Accreditation Programs in 2002 and became Director of Coaching Education Programs in 2005. Diana is a USAV CAP Level III accredited coach and became a USAV CAP Cadre member in 2000. At USA Volleyball, Diana directs all facets of the coaching education programs, including IMPACT and the Coaching Accreditation Program (CAP). Diana also authored the National Federation of High Schools (NFHS) Fundamentals of Coaching Volleyball online course which launched in the Fall of 2009, and has had a hand in consulting/editing three textbooks for the American Sport Education Program (ASEP) and Human Kinetics. Dr. Davis has worked in the elite sport field for more than 30 years, cultivating a diverse and unique career in several countries and different sport systems including: Exercise Physiologist at Nike; Director of Sport Sciences and Sports Medicine for the Australian Institute of Sport (for the Olympic Athlete Program); Director of Coaching, Sport Sciences and Technology at the U.S. Olympic Committee; Director of High Performance for Australian Rugby; and Director of Sport Science, Sports Medicine and Research for the Own The Podium Program in Canada. Currently Dr. Davis is the Founder and President of Sport Performance Management, an independent consulting firm based in Colorado, working with over 8 National Olympic Committees, over 50 National Governing Bodies, 60 Provincial Governing Bodies and other sport organizations in the areas of Strategic Planning, Long Term Athlete Development, building coaching systems and other specific performance related projects. Demings joined USA Basketball, the governing body for basketball in the nation, in November 2013 to guide its newly created youth basketball division. Demings will oversee all facets of the department, including the development of youth basketball initiatives that address player development, coach education and safety in sport. He arrives at USA Basketball with 16 years of experience in boys and girls basketball and a master’s degree in sport leadership from Northeastern University. He served as director of operations for the Boston Amateur Basketball club in Boston, where he oversaw all aspects of the non-profit basketball program. From May 2011 to August 2012, Demings was a sport director at Boys & Girls Clubs of America in Warwick, R.I.
Dieffenbach is an associate professor of Athletic Coaching Education at West Virginia University and an Association of Applied Sport Psychology certified consultant. Currently she is the president of NCACE (National Council for Accreditation of Coaching Education). Kristen is also a professional coach with a category 1 (elite) USA Cycling license and a Level II endurance specialization from USA Track and Field. She been a coach for over 18 years working at the high school, collegiate, recreational, and elite levels. Her research interests include professionalism and ethics in coaching, athlete talent development and underrecovery. Farrey, a Murrow and Emmy Award-winning journalist and author of Game On: The All-American Race to Make Champions of Our Children, has directed the Sports & Society Program since its inception in 2011. The vision for the program flowed from his work as a long-form reporter with ESPN, including the 2008 publication of Game On, an investigation of the culture and structure of modern youth sports that became a required text in courses at many universities. In 2013, Farrey received an Edward R. Murrow Award for his piece on a paralyzed youth football player. Two of his other ESPN Outside the Lines stories have won sports journalism Emmy awards. Dr. Gilbert is a frequent contributor to scientific periodicals, books, and popular media reports on sport coaching issues. He has directed research and applied consulting partnerships with coaches and athletes across multiple sports and countries. He is the Editor-in-Chief for the International Sports Coaching Journal and Associate Editor for the Journal of Sport Psychology in Action. Dr. Gilbert also co-edited the Routledge Handbook of Sports Coaching and serves as a scientific advisor for BeLikeCoach, a non-profit dedicated to improving the quality of youth sport settings. Inzerello is the senior director of football development for USA Football, where he is responsible for programs and resources serving football coaches, game officials, youth league administrators and players. This includes USA Football’s nationally accredited coaching education program for youth tackle, flag and high school coaches as well as programs including Heads Up Football, FUNdamentals, NFL FLAG and Punt, Pass & Kick (PP&K). In addition to his work at USA Football, Inzerello has served as a volunteer football coach in the Fairfax County (Va.) Youth Football League and serves on the Board of Directors for the National Council for Accreditation of Coaching Education (NCACE). Lara-Bercia is a Spanish former professional basketball player and coach who has lived in the UK since 1999. In his 20 years of experience coaching, Sergio has been fortunate to work at all levels of the participation spectrum, from beginners to internationals. He has also led the development of the UK Coaching Children Curriculum, as well as producing a suite of resources for children’s coaches. At the International Council for Coaching Excellence, based at Leeds Metropolitan University, he has project managed the development of the International Sport Coaching Framework and has served as an advisor for countries such as South Africa and the Philippines. An M.Sc. in Sport Psychology, he is in the process of completing his PhD studies in the area of Psychosocial Development of Children In and Through Sport. Martel has worked for USA Hockey for the past 15 years. The first 8 years of which as a National Team Coach at the U17, U18 and U20 divisions, including coaching USA Hockey's first world championship gold medal teams at U18 and U20. He is currently USA Hockey's Technical Director for the American Development Model, the organizations player development program. Prior to joining USA Hockey, Ken held coaching positions at St. Cloud State University, Michigan Tech University and the United States Air Force Academy. McCann is one of the nation’s leaders in coaching education, having been elected President of the National Council for the Accreditation of Coaching Education in 2007. Dave also serves as President of the Institute for Sport Coaching. Prior to coming to USA Rugby, Dave was the U.S. Olympic Committee Manager of Coaching Education. In 2003 Dave joined the U.S. Ski and Snowboard Association as Director of Education Services. Dave started his career in coaching education in 1995, with the American Sport Education Program as its Associate Director. Dave has an MBA from Wake Forest University. In 25 years with the company, Miller has risen through the ranks at Human Kinetics from intern to VP. For 14 of those years he directed HK’s Consumer Division, increasing sales revenue more than five-fold during that span. Miller has acquired and overseen the development of hundreds of instructional books and DVDs, including those by coaching legends like John Wooden, Dan Gable, and Mike Krzyzewski. He has also forged successful business partnerships with several dozens of sport and coaching organizations, and most recently reached an agreement with the International Council for Coaching Excellence and the American Association of Health, Physical Education, Recreation, & Dance to publish a new online coaching journal starting in January 2014. Morris is the North America Executive Director of Access to Sport, an organization supported by NIKE Inc. dedicated to unleashing human potential by enabling and inspiring youth participation in sports, active play and increased levels of physical activity. A 10-year veteran of NIKE Inc, Ms. Morris has served in various business leadership positions in Corporate Communications and Sustainable Business and Innovation. As Senior Director of Integration and Collaboraton, Ms. Morris led stakeholder engagement and partnership efforts focused on improving working conditions in the supply chain. As Stakeholder Partnerships Director for the Mobilize team, she focused on integrated advocacy efforts to accelerate human potential., including global partnerships leveraging sport for development. Prior to joining NIKE, Caitlin spent seven years at Mattel, Inc. working in corporate responsibility and international government affairs. Nolting oversees the coaches education program for the USSA. In the past year he has developed an on-line foundational ski and snowboard coaching course that is now a requirement for all USSA member coaches. In addition, he has been a driving force in developing the USSA’s long-term athlete development (LTAD) framework and infused LTAD programming into the coach education and certification system. He has taught coaches clinics for the past fifteen years in alpine skiing and currently coaches youth soccer while working through the U.S. Soccer coaches education system. Plowman serves as the Director of Partnerships for NIKE’s Access to Sport division. In this role, he leads the management of major partnerships within the public and private sector. He has previously advised a number of non-profit and for-profit organizations, including Nike’s Sustainable Business & Innovation group, with the goal of aligning business performance with sustainability and social good. He holds a Master’s degree from Oxford University. Riewald works in partnership with the eight winter sport National Governing Bodies to coordinate sport science and medical services as well as other forms of support for winter sport athletes. Riewald manages a sport science staff with expertise in exercise physiology, sport nutrition, sport psychology and strength and conditioning. Prior to the USOC, Riewald worked for the United States Tennis Association, where he served as the sport science administrator in its player development division. He worked closely with the sport science staff, the coaching education department and the USTA sport science committee to integrate sport science, sports medicine and technology with the goal of developing high performance tennis players. Before his work with USTA, Riewald spent four years as the biomechanics director for USA Swimming. E. Paul Roetert, Ph.D., is the Chief Executive Officer of the American Alliance for Health, Physical Education, Recreation and Dance (AAHPERD). AAHPERD is the largest organization supporting and assisting professionals involved in physical education, recreation, fitness, sport and coaching, dance, and health education. Prior to this position, he was the Managing Director of the United States Tennis Association’s (USTA’s) Player Development Program and Tournament Director of the U.S. Open Junior Tennis Championships. He was also the Executive Director for the American Sport Education Program at Human Kinetics, in Champaign, Illinois. He is a Fellow in the American College of Sports Medicine, and he received the Editorial Excellence Award from the National Strength and Conditioning Association for his work on the Journal of Strength and Conditioning and Research. Prof. Sagas' primary line of inquiry in the field of sport management has been focused on the under-representation and differential treatment of youth, women and minorities in sports. The general goal of this research has been to provide theoretical and practical insights needed by scholars, policy makers, and managers to identify the barriers that limit the status, development, advancement and well-being of youth, women and racial minorities in sports. Sagas has authored or coauthored over 80 refereed journal articles and is a Research Fellow of the North American Society for Sport Management. Sagas also serves the University of Florida as the Faculty Athletics Representative to the NCAA and SEC. Schuster is the Assistant Director of Coach Education and also is the editor of the NFHS Ice Hockey Rules Book. Dan has been with the NFHS since August of 2008. Dan received his Bachelor’s degree in Sport Communication and his Master’s degree in Athletic Administration from Indiana University. Dan is responsible for many of the day-to-day operations of the NFHS Coach Education Program (www.nfhslearn.com). He has had the opportunity to be involved in the strategy, planning and growth of the NFHS Coach Education program. He actively promotes the program to member state associations and NFHS partners nationwide. Smith is the director of education and training at U.S. Lacrosse where she guides the organization’s national strategies for the development and implementation of its national standardized training and certification programs for coaches and officials of men’s and women’s lacrosse at the high school and youth levels. She has worked at U.S. Lacrosse since 2004 and resides in Baltimore, MD. Smoll’s research focuses on coaching behaviors and the effects of competition on children and adolescents. He has published more than 135 scientific articles and book chapters, and he is co-author of 22 books and manuals on youth sports. Dr. Smoll is a fellow of the American Psychological Association, the Association for Applied Sport Psychology (AASP), and the National Academy of Kinesiology. He is an AASP Certified Consultant and was the recipient of AASP’s Distinguished Professional Practice Award. Dr. Smoll has extensive experience in conducting psychologically oriented coaching clinics and workshops for parents of young athletes. Snyder’s responsibilities include discovering and providing resources to better benefit sport culture and the National Governing Bodies that service sport in our great nation. In addition, he is focused on supporting both the Sport Performance Department and Team USA coaches as they strive to be the best they can be. Previously, Snyder served as the Manager of Coaching Education and Training for U.S. Lacrosse. In addition to guiding the coaching education program for U.S. Lacrosse, he also served a large role in curriculum development, resource implementation, and event programing. Snyder hails from Central Pennsylvania and holds an undergraduate degree from Shippensburg University and a Masters of Education degree in Sport Management from Millersville University. Thompson founded PCA, a non-profit formed at Stanford University with the mission to create a movement to transform the culture of youth sports so that all youth athletes have a positive, character-building experience. Jim was previously director of the Public and Global Management Programs at the Stanford Graduate School of Business. Since its founding in 1998, Positive Coaching Alliance has developed a network of more than 130 trainers across the U.S., who have delivered 10,000-plus workshops for youth sports leaders, coaches, parents and athletes. Thompson is the author of eight books and was named one of the Top 100 Sports Educators in the U.S. by the Institute for International Sport in October 2007.
how can sports best produce a physically-active lifestyle? Sports promote physical activity, but some provide more than others. Held at the American Heart Association's Global Congress on Physical Activity, this Aspen Timeout moderated by Tom Farrey explored which forms of sport produce the greatest health benefits for children -- and which carry the greatest safety risks. Topics included organized vs. unstructured sports, interscholastic vs. intramural sports, team vs. individual sports, and best practices by coaches. Panelists were Dr. William Dietz, Past Director, Division of Nutrition and Physical Activity, U.S. Centers for Disease Control; Dean Kriellaars, Ph.D. CEP, University of Manitoba School of Medical Rehabilitation, Department of Physical Therapy; and Gary Hall Jr., Principal, Hallway Consulting, 10-time Olympic medalist in swimming. Session audio available for purchase only at American Heart Association website. reimagining youth sports in America: what's in it for girls? At the ESPNW Summit, Tom Farrey shared the vision of Project Play. He explained why identifying solutions that address the access barriers faced by children from low-income communities holds the promise of delivering the next wave of participation growth in girls' sports. While urban, low-income girls are among the most underserved populations in all of sports, progress lies in serving all kids in areas that lack viable parks and gyms, and available, well-run sport programs. How can professional athletes can best use their resources (fame, foundations, credibility) to get and keep more children active and healthy through sports, and support communities in need most effectively? Tom Farrey moderated a featured conversation on that topic with NBA All-Star Chris Paul, a member of the President’s Council on Fitness, Sports and Nutrition who explain why he gives back. The event was held at the Los Angeles studios of ESPN, a partner in the Aspen Institute’s Project Play, and served to anchor a multi-platform package that engaged ESPN and Aspen Institute audiences. Early Positive Experiences: What is Age-Appropriate? Hosted at the U.S. Open and sponsored by Nike, the roundtable convened more than 25 leaders and experts to consider the prospects of anchoring the disjointed U.S. sports system in the principles of age-/developmentally appropriate play, with the goal of meeting the needs of today's children -- all of them. The event was the first of four scheduled gatherings through March 2014 focused on how to grow the quality and quantity of youth coaches, given the critical role they play in delivering early positive experiences to children between the ages of 6 and 12 and helping kids create lifelong patterns of health and fitness. • What role did coaching, PE, other factors play in the development of Olympians? • How has pathway changed over past generation? • Why is it important that coaches, coaches, stakeholders know the pathway? • How does ignorance of the pathway limit the quality, quantity of kid athletes? • What does the research say about early specialization vs. early sampling? • What’s the evidence in support of the celebrated “10,000 hours rule”? • How do we make room for the late bloomers, late adopters? • What has USA Hockey learned about opportunities, challenges with ADM? • What’s happening with USOC and other NGBs in terms of adopting ADM? • How can NGBs push ADM down pipeline? • Do sport bodies outside the Olympic family want to embrace ADM? • What exactly is the definition of physical literacy, and what are its components? • Should we adopt the goal of making every US child physically literate by age 12? • What do we want to adopt from Canadian model of physical literacy? • What is the appropriate ask of sport organizations, schools, other providers? What Do We Really Know About Developing Child Athletes? For parents and kids, just about every signal from the culture conveys the idea that a high dose of one sport at a young age is the pathway to athletic stardom. But what do we really know about early specialization and the “10,000 hours rule?” What’s the role of nature vs. nurture? And what’s the best way to develop the potential of all children? Moderated conversation served as a prelude to full-day roundtable on Sept. 4 on prospects of anchoring our sports system in the principles of age-appropriate play. The Aspen Institute’s Project Play was launched at a three-day summit in Aspen, Colorado that convened 80 high-level leaders for a series of educational and brainstorming sessions. Underwritten by the Robert Wood Johnson Foundation, the invitation-only event included voices from across health, business, academia, sports, media and philanthropy, representing more than 100 million direct constituents and more than 30 million youth athletes. Featured participants included: Scott Blackmun, CEO of the U.S. Olympic Committee; David Drummond, Senior Vice President, Corporate Development and Chief Legal Officer at Google; Ginny Ehrlich, CEO, Clinton Foundation's Health Matters Initiative; Scott Hallenbeck, Executive Director, USA Football; Michelle Kwan, 5-time world champion figure skater in U.S. history and Public Diplomacy Envoy, U.S. State Department; Craig Robinson, Head Coach, Men’s Basketball Oregon State University; Sharon Roerty, Senior Program Officer, Robert Wood Johnson Foundation; Larry Soler, CEO, Partnership for a Healthier America; Steve Stenersen, CEO, U.S. Lacrosse; John Walsh, executive editor, ESPN; and Jim Whitehead, CEO, American College of Sports Medicine. Aspen Daily News: "Athletes to Local Kids: Train Hard, Have Fun"
Aspen Idea blog: "The Aspen Institute's Project Play Launches"